Hosa YMM-492 Stereo 3.5mm Mini Female to 2 Mini Mono Right-Angle Male Y-Cable - 6"
Product #21957 | SKU YMM-492 | 0.0 (no ratings yet) Thanks for your rating! 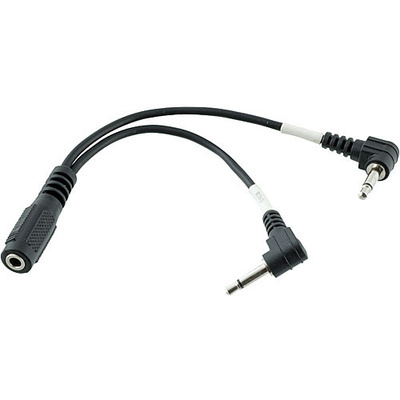 This Hosa Stereo 3.5mm Mini Female to 2 Mini Mono Right-Angle Male Y-Cable will combine separate Right and Left signals into a single stereo signal. This configuration is also dubbed as the "Air-Travel Headphone Adapter" because it allows connection of mini plug equipped stereo headphones to the dual-mono jacks found on many commercial airlines.